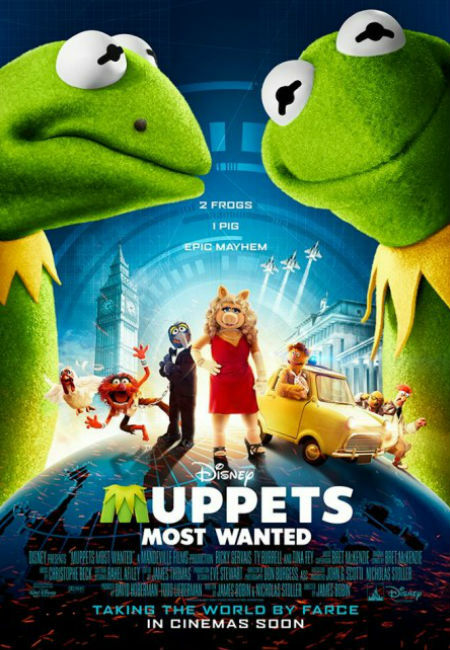 So what if I saw “Muppets Most Wanted”? I will admit that Fozzy Bear is a friend of mine and he had nothing to do with the Goldilocks incident. I was afraid this movie was about that case, or worse they dug up more evidence from when the Muppets took Manhattan in 1984, but no, this is an all-new, exciting motion picture. Kermit T. Frog and the gang are just coming off their recent Broadway success when they are approached by Dominic Badguy (Ricky Gervais from “The Invention of Lying”), who wants to book them on a world tour. He seems so nice, there is just no way to tell that Badguy is a bad guy and he is scheming with the notorious Constantine to rob the Crown Jewels. I forgot to mention that Constantine is a dead ringer for Kermit, except for a mole on his lip. He breaks out of jail, frames Kermit and takes his place. Badguy and Constantine, posing as Kermit, begin the crime spree necessary to obtain their prize. Hot on their trail are world-class detectives Jean Pierre Napoleon (Ty Burell from “Modern Family”) and Sam Eagle. All while the real Kermit is stuck in a gulag guarded by Nadya (Tina Fey from “Admissions”). To complicate things further, Constantine proposes to Miss Piggy, and now Kermit not only has to save the Muppets and the Crown Jewels, he must save his beloved from a matrimonial Muppet mistake. I was on the edge of my seat. It was great to see Kermit play this dual role so we could finally see the range he has and his ability to jump from one character to the other. He is a long way from the lilly pad, playing against great cameos from the likes of Ray Liotta and Frank Langella. From my viewpoint, Kermit went toe to webbed foot with those two men and now they are now green with envy. If I am forced to rank this edition along all the other Muppet movies, I have to say this is the latest one. While this movie did not have the heart and soul and charm of the last movie, this feature brought back many of the favorite site gags and puns. For that, I must give this movie 3 ½ stars out of 5. If they make another one, I will make that rainbow connection: the lover, dreamer and me.